Thank you for your interest in this project! We are currently (as of May 2017) still working on excavating this mammoth, whose name is "great Dane," in honor of the son of donors/UNLV alumnae Ernesto and Jenn Moran. For the latest information, click on the updates tab. If you are interested in supporting this project and other paleontology projects by UNLV students and faculty, click here and select "Paleontological Research" from the drop-down menu under Donation Information. Thank you for your interest and support! 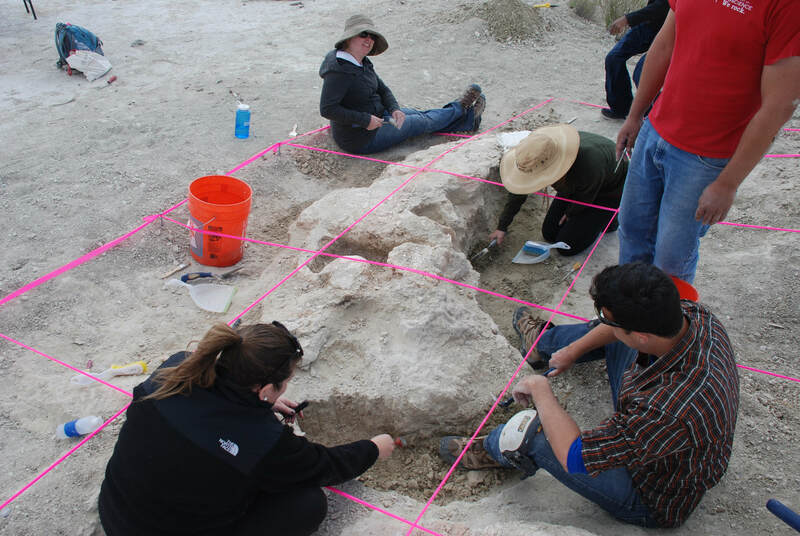 UNLV paleontology students and faculty are excavating bones and tusks of a Columbian mammoth at a remote site in Nye County, Nevada, about a two-hour drive from Las Vegas. The site is on Bureau of Land Management land, and we are working collaboratively with the BLM on this project. We need funds to transport students to the site, for field supplies, to remove and transport the fossils to the fossil prep lab at the Las Vegas Natural History Museum, and for analyses (such as radiocarbon dating and fossil pollen analysis). So far, we have one radiocarbon date of about 20,000 years, which puts this animal in a time interval that scientists call the Last Glacial Maximum---a time during the Pleistocene Ice Age when conditions were the wettest and coldest they have been in the last 100,000 years. We do not yet know the age (since birth) of this particular animal. The tusks are very large, which indicates that this animal was a full-grown male. Once we recover the tusks we will use CT-scanning to study their internal structure, which will allow us to determine how old this animal was when it died. An unusual and puzzling feature of this animal is that its tusks are pointed straight into the ground. Furthermore, we are finding abundant freshwater snails and clams in the sediment surrounding the bones; this strongly suggests that the animal died in a pond or marsh. Our working hypothesis is that this animal died with its feet planted in the soft, "soupy" sediment at the bottom of a pond. Perhaps its feet were stuck and it could not move. The water was deep enough (in our hypothesis) to partially support the animal's body until it began to decompose, so that when it died it did not immediately fall over. It remained in an upright position, perhaps for a few weeks. The heavy tusks caused the animal's head to fall forward, so the tusks plunged into the soft sediment and remained in that position, where we find them today, 20,000 years later. Eventually, the carcass would have decomposed and fallen apart, scattering bones on the bottom of the pond. We have not yet found the animal's leg bones, but our working hypothesis concerning its death gives us reason to be hopeful that we will find them down near the level of the distal ends of the tusks. The tusks are intact relative to each other. Only the bases of the tusks have been excavated so far, so we have plenty more work to do. As we exhume more of this animal's skeleton, we will be able to test our ideas about how it died. After we get the fossils back to the lab, the analyses will continue. Tusks grow incrementally, like trees. By studying the detailed internal structure of this animal's tusks we will be able to determine how many years old it was when it died, the age at which it became sexually mature, when it experienced stresses in its life, and the season in which it died. This research will contribute to a better understanding of why Columbian mammoths became extinct. Any donation is sincerely appreciated, and will be well spent. Thanks for your interest and support. A contribution at this level will help us buy supplies for this project, such as brushes, trowels, and dental picks. Your contribution at this level will assist in purchasing chemical consolidants (we use a product called Paraloid) to stabilize the bone as it is exposed, and the acetone we need to dissolve the Paraloid, as well as plaster of Paris we use to make plaster jackets. Your contribution at this level will go a long way toward supporting our transportation to the excavation site. We pay $115 per day for the use of each UNLV vehicle. Your contribution at this level will go toward the expense of removing heavy, plaster-jacket-wrapped bones and tusks from the excavation site and transporting them to the Las Vegas Natural History Museum. We may need to contract with a company with construction equipment to accomplish this. Your very generous contribution at this level will pay for radiocarbon dates (@ $300) and pollen analyses (several hundred dollars) to properly date these fossils and study the environment in which the animal lived. Donors at this level are cordially invited to visit our excavation site and assist in the excavation. 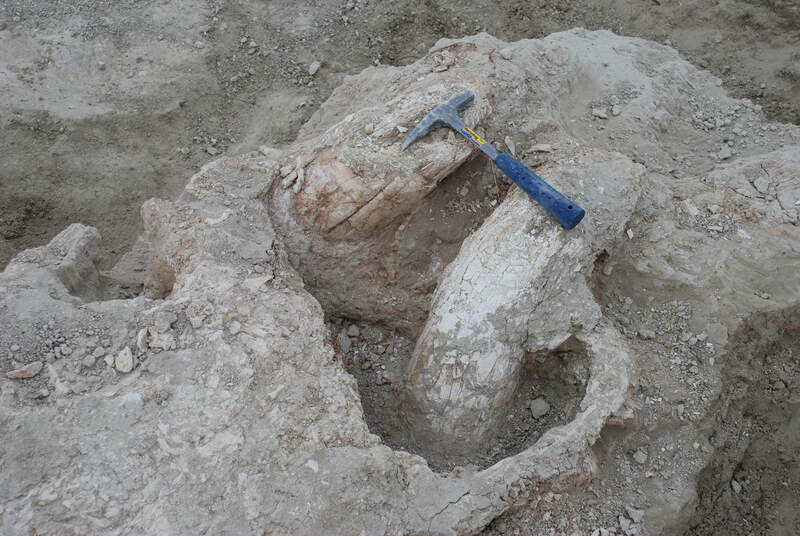 We invite one generous donor to help us find an appropriate name for this mammoth, as well as to visit the excavation site. Perhaps you would like to name it after one of your children or grandchildren. The chosen name will become the permanent appelation of this mammoth.